Xiaomi has introduced gift cards that can be used to purchase products ranging from smartphones, accessories, and televisions to smart devices. The Mi Gift card has been launched by Xiaomi in partnership with SaaS-based prepaid card solutions provider Qwikcilver. The gift card that you can send to anyone via email, comes with a minimum limit of Rs. 100 and a maximum purchase value of Rs. 10,000. Notably, a maximum of 10 gift cards can be availed in one order. 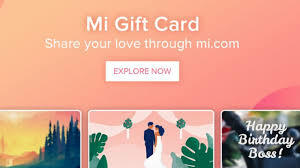 Users can choose from a gallery of gift cards available on Mi.com or Mi Store app, and also get it customised by uploading an image or design, Xiaomi noted in a Mi thread. The e-gift card can be sent and received by email and can be added to the users Mi account instantly. "Digital gifting is gaining momentum in India and our association with category leaders like Qwikcilver will empower Mi fans to spread the Xiaomi cheer among their loved ones and enjoy a hassle-free, digital gifting experience," Raghu Reddy, Head of Online sales and category, Xiaomi India said in a release. In order to purchase a Mi gift card, you will have to visit the dedicated page on Xiaomi's website. After selecting a Mi Gift Card of your choice, you will have to fill in details like sender's info, recipient's info, a message, gift card amount, and delivery date. Once completed, you will have to pay for the gift card via credit/ debit cards, EMI on credit cards, or UPI. Once the process is completed, the recipient will get an email, which will include information such as transaction details and the available gift card balance. To redeem a Mi gift card, you will have to go to Mi Store app > My account > Add Gift Card. Further, enter the 16-digit gift card number and the 6-digit pin that you got in the email. Clicking on the Add Gift Card button will ensure that the amount is credited to your account. You can use this value to purchase products from Xiaomi. Notably, the Mi Gift Card expires in 12 months from the date of issue and in case of return of a product partial or full payment will be refunded to the same Gift Card.